← Is it okay to let my boyfriend get to second base at 16 going on 17? My 14 year old cousin Chuck, made a fool out of me, he got out of the car and walked like a spaz..
March 8, 1964, Sunday. Most embarrassing day of my life. Family Day, Billee’s first Communion. Had to get up at 7:00 am. Got five hours sleep. Was dead tired. Whole family went to Church. Billee was so happy and excited. Came home and ate. Then my sister Donna and my cousin’s Chuck and Nancy and I went to Toes. No one was there. Drove to Lew’s. Dave Kendal told me Howard was there. Went in with all the napkins Bryan threw in my car at the Flying Jib. Lew was there. No one else. They were going to a Dance. Told Lew how I felt about Howard lying to me. Then Howard came in and started lying again. Said he just came from a Funeral. (I’m sure!!! On a Sunday.) Walked to my car. My 14 year old cousin Chuck, made a fool out of me. He started fighting with Nile’s and Howard. Chuck told him I sing “I love you Howard.” I almost died. He wouldn’t stop. Kept saying things like I would beat any of you punks up. (These were big guys – Surfers.) I just wanted to get out of there cause my face was red. The car wouldn’t start. The guys had to open the hood. Finally we left. Howard said he’d call tomorrow. Went to the gas station. Chuck got out of the car and walked like a spaz. People were looking. They thought he was nuts. Howard’s going to the dance to pick up on girls, I just know it. Billee’s first Communion. 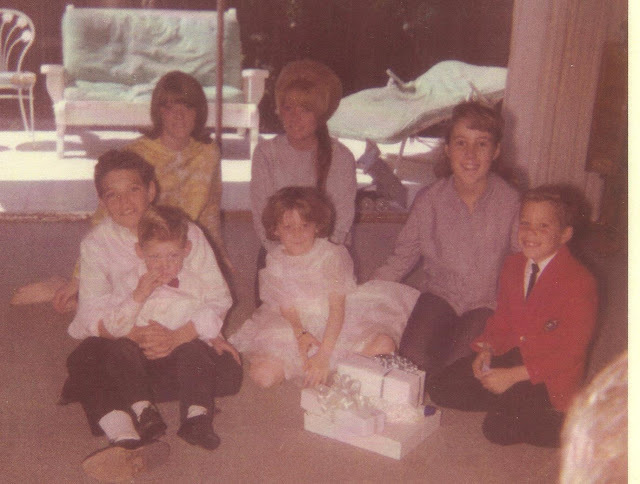 Top left, Donna and Sharrie Williams, Nancy and Jimmy Williams. Bottom left, Chuck Williams holding Preston Williams, Billee Williams. This entry was posted in 1960's Surf Culture, 1964 High School Diary and tagged 1964, Beach, Culver City, Culver High School, Gidget, going steady, making-out, Maybelline, Maybelline Story, Playa del Rey Los Angeles, Saffrons Rule, Sharrie Williams, Southern California, Spaz, teenagers, West Side Surfers, Westchester High School. Bookmark the permalink.